In Zaragossa, Spain, the feast of Our Lady of the Pillar is a day of special rejoicing. Our Lady of the Pillar is the patroness of policemen and postmen; and the day is treated like a holiday, commemorated with processions, conventions, and other festivities. The image of Our Lady of the Pillar is a wooden statue decorated with gold; it is about fifteen inches high. The crown adorning the head of the statue is very intricate. It was made in forty-four days by thirty-three workmen; in it there are 2,836 diamonds cut triangularly, 2725 roses, 145 pearls, 74 emeralds, 62 rubies and 46 sapphires. 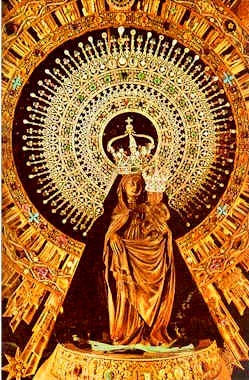 The crown of the Infant is identical with that of the Virgin, except in size. The history of this particular statue of Our Lady is unique and quite interesting. Saint James the Greater, one of Our Lord's twelve apostles and one of the Son's of Thunder, fearlessly traversed the lands now known as Spain and Portugal to preach the faith to those who lived in spiritual darkness. Although he worked tirelessly, and suffered greatly in his labors, his early efforts in the region bore little fruit. The Blessed Virgin Mary was still living in the year 40, and was aware of Saint James' distress. Like a true mother, and in order to console the saint, she miraculously bi-located hundreds of miles to appear to Saint James while he was praying along the banks of the Ebro River in Zaragossa. When the saint looked up from his prayers, the Blessed Virgin stood before him upon a pillar supported by angels, and she encouraged Saint James by revealing to him the great faith that the people of Spain would possess in the future due to his sacrifices. She gave St. James her effigy, requesting that he build a chapel in there in her honor. Saint James complied, constructing the first church in Spain. This event is the first known and earliest recognized apparition of Our Lady, and one which took place while she was still living on earth. It is interesting to consider that in her book, The Mystical City of God, the Venerable Mary of Agreda wrote that the Blessed Virgin was transported to Spain from Jerusalem carried in a cloud by angels. It was these angels who also crafted the pillar of marble and created the statue of Mary, their queen, holding her Diving Son. To the original small chapel a much larger church has been added over the years called Our Lady of the Pillar. During those many years the kisses of the pilgrims to the shrine have made a hole in the pedestal so large that a man's head can rest therein. Many miracles have been performed at the shrine of Our Lady of the Pillar; one in 1640 when the limb of a man, Juan, a native of Colanda, was cured. In remembrance of the apparition of Our Lady, the people of Zaragossa made a vow in 1642 to honor always Mary as the patroness of their city. More than a hundred years ago, when Zaragossa was besieged by a large French army, a few men and women with sixteen cannon and some shotguns defended the town for two months. The French eventually defeated the defenders of Zaragossa and sacked the famous town. They took everything, but they did not dare touch the treasures of Our Lady of the Pillar. One of the generals was an exception, boldly taking one of the jewels to carry home to his wife, offering the Virgin in exchange a valuable gift. In his next battle, the general's leg was taken by a cannon ball. It was during this terrible siege that the people began to recite the verse so well known to the Spanish: "The Virgin of the Pillar says she does not want to be French. She desires to be the leader of the Aragon troops." In 1730, Pope Innocent XIII authorized veneration to Our Lady of the Pillar throughout the entire Spanish Empire, and it is under this title that the Blessed Virgin is invoked as the Patroness of Aragon. Saint Pope Pius X conferred upon the image a canonical coronation in the year 1905.